Some overnight rain on the previous two nights had washed away much of the white lines but the lawns were fine for play. The visitors paid compliments through the day about the lawns and drainage. League leaders Llanfairfechan were looking for one further win from their remaining two matches to take the league championship and were on top form. At the end of the morning doubles, the teams shared success with 3 wins each. Alan and Cath very kindly came and catered the lunch which was excellent. Two early afternoon games were completed quickly, which lead to an impromptu change of order of the games being played and some confusion. At the end of the first four singles games, the scores remained level at 5-5, with Peter and Philip winning one each. Barbara Jones was playing her first league match and settled in easily at the little club with the big heart, winning all her singles matches on the day. Fylde could only secure three more wins, narrowly missing a further Golden Hoop opportunity. Congratulations were given to Llanfairfechan for their league success and they praised Fylde's efforts, describing the day's win as one of the tougher ones of the season. A pleasant, sunny day for the match. Chris Thomas was playing her first North West Federation League match. The doubles matches were shared 3-3. Alan and Catherine won 7-4 against Rosemary and Jayne. Alan had a close game with Rosemary. He was 5-6 down but a jump shot winning hoop tied the game. Good positions at hoop 13 enabled Alan to win the game. Catherine beat Jayne 6-5 in a level play game. Alan had the only win beating newcomer Chris 7-4.The match score was now Fylde 6 Chester 8. Catherine had the only win beating Chris 7-5. This meant that Fylde needed to win the 4 remaining games to tie the match. Alan capped a good day with his new handicap by beating Jayne 7-4 but he was the only win and so Chester had a 6 point win. A good match played in a competitive but friendly atmosphere. The Fylde players put Chris at ease and also offered her some advice. 20 matches were played to the full 7 points on time. Much thanks to Liz who organised lunch for the players-greatly appreciated. Thanks to Catherine for organising the dishwasher as there was another match the following day. The next Golf match is Llanfairfechan at home on September 5. The lawns were again in beautiful condition and as usual fast. The 6 doubles games were played first with Fylde winning 4 out of the 6. The singles games were then played with the bisques used in the difference style.Alan Mayne played in brilliant style to win all his games dispite giving away umpteen bisques. In all Peter won 2 games Ian won 2 Betty won 3 and Ken won 2. So the result was a good win for Fylde. A showery day at Earby. Lawn 1 looked as though it been recently maintained and the grass was a little longer than normal. Worms were everywhere on the lawns. Fylde got off to a very good start playing well and winning the first 3 games but then failed to win another doubles game. * Alan and Cath beat Ron and Barbara 7-2. At hoop 8 all four balls were lined up one behind the other -never seen that before. * Catherine and Philip beat Geoff and Joel 6-5. Philip’s jump shot prowess was causing a few raised eyebrows from our hosts. * Alan and Philip beat Ron and Joel 6-5. * Catherine and Cath lost 4-7 to Geoff and Barbara. * Alan and Catherine lost 5-7 to Ron and Geoff. An extra turn was used to clear Red from Hoop 12 but Alan’s black ball travelled into the jaws of the hoop and ran it but as it was an extra turn the hoop did not count. Alan came back through the hoop to try and block Yellow from clearing Blue but only succeeded blocking the partner ball and the game was lost. One to add to the practice schedule. 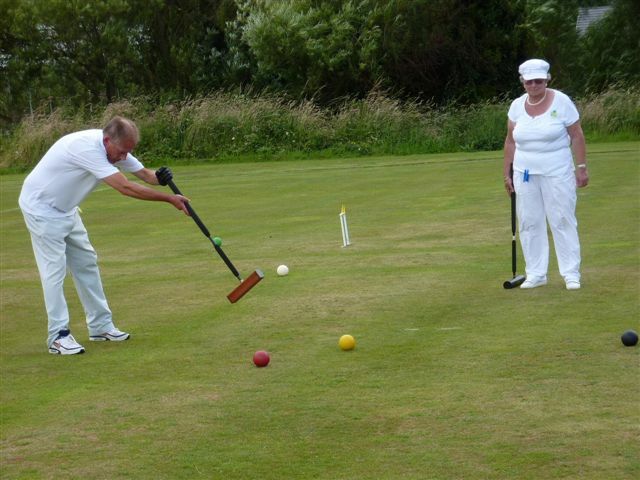 * Philip and Cath lost 4-5 to Joel and Barbara. Philip was the only win in this round beating Ron 6-4. Alan had the only win in this round beating Barbara 7-4. Fylde were trailing by 4 games . This round was halved with Catherine winning a Golden Hoop game 7-6 against Ron and Alan beating Geoff 6-4. Alan had the only win beating Ron 7-4. 15 out of 22 Games were completed within time. Alan has moved to Handicap 6. The fish and chips on the way home were postponed as the team were not hungry. A heavy shower of rain just before the start of play made the lawns a little slow paced. Fylde won 4 of the doubles matches to put them in a good position at Lunch. Jump shots could be seen all morning from the Culcheth players and Fylde had to make sure they moved any ball within Jump shot distance. However, Bob had the most spectacular in trying to save the game against Alan and Philip when he attempted a shot from several yards which had the height but the direction took it past the hoop. Alan and Ian lost on a Golden Hoop to Bob and Alan. Alan had set up to run hoop12 and tie the game but some good tactical play by Bob left him in the best position to approach Hoop 13 and so win the game. Ian and Philip also lost 6-7 to Alan and Pat . Fylde 4-2 at lunch. Fylde 2 Culcheth 2- Alan won hoop 5 against Bernard with a jump shot left his ball in front of Hoop 6 to win consecutive hoop points. Fylde 2 Culcheth 2-Ian and Alan won Golden hoop games to keep Fylde in front. Philip lost to Bob on a Golden Hoop game. Fylde needed 2 wins from this round to win the match. Alan lost to Bob 6-7. But Ian, Philip and Geoffrey all won their games to give Fylde a 13-9 win. Congratulations to Ian who won 6 matches, triggered handicap 7 and gave a Mars Bar performance Thanks to Cath and Betty who served teas and laid out the buffet for the players. Much appreciated. At last a win for Fylde - third time lucky! The mixed weather conditions at Coronation Park saw the teams, adding and removing layers through the day. In the morning session Fylde quickly won four out of the six doubles games, with only one game going to full time. With time to spare, it was agreed to play a singles match before lunch. Two wins for Ian and Betty gave a lunchtime score of 4-6 in Fylde's favour. In the next two rounds, Fylde won five of the eight games and needed to win at least one remaining game to take the match. 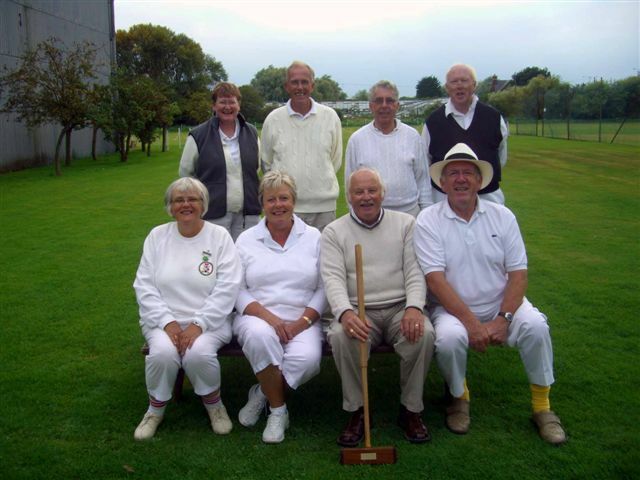 Ian, Philip and Betty won their matches to take Fylde to victory. Ian was man of the match, winning all SEVEN of his games. Well done and a very large Mars Bar owed by the Match Captain. Fylde: Catherine Bass (c), (9) Geoffrey Lipshaw (10), Philip Bass (11), Catherine Morton (12). Bury Souths: David Dean (3), Judith Gaskell (c)(5), Ken Eccles (12), Margaret Eccles (12). Fylde struggled to find form in the morning doubles, managing only one win out of six remarkably low scoring games which all went to full time – 18 hoops to Fylde, 28 hoops to Bury from 6 games. After lunch, the pace quickened. Fylde made a better showing and by mid afternoon, play was drawn 9-9. However, Bury Souths fought back to level the singles play with 8 games each. Fylde lost the opening round 3 games to1. Alan had the win beating Jean 7-3. This round was halved with a win for Catherine 7-5 against Jean and Alan beating Sandra 6-5. Again this round was halved with Catherine winning a Golden Hoop game 7-6 against Mary and Philip beating Sandra 6-5. This round was also halved with wins for Alan beating Mary 7-3 and Philip beating Jean 6-5. So at lunch Fylde were two games behind with the score at 9-7 to Southport. Margaret Flemington had a very good performance winning all her 4 singles matches. After an excellent lunch, Fylde set about to try and close the 2 point gap in the score. Catherine and Philip got off to a good start by comfortably beating Margaret and Jean 7-3. Alan and Cath had a closely contested match before losing 6-5 to Mary and Sandra. Catherine and Cath had an excellent 6-2 win over Margaret and Sandra but again in a close game Alan and Philip fought back from 5-2 down to eventually lose 6-5 to Mary and Jean. This meant that Fylde needed to win the remaining 2 doubles to tie the match. Cath and Philip had a Golden Hoop win 7-6 but unfortunately Alan and Catherine found Mary and Margaret to be in good form and lost 6-2. A good effort by the team on a very hot day.